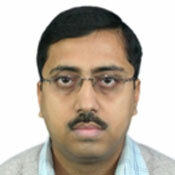 Dr. Pinaki Mukherjee, Assistant Professor of Electronics and Communication Engineering, obtained his B.Sc. (H), B.Tech & M.Tech. from Institute of Radio physics & Electronics, Calcutta University & PhD(Engg.) from Jadavpur University. He has served Jalpaiguri Govt. Engg. College for five years and Institute of Engineering & Management, Salt Lake for 10 years. He has been teaching Basic Electronics, Digital Electronics and Digital Signal Processing. His present research work is on application of softcomputing techniques in microwave engineering and antennas. He has published a number of research articles in different refereed journals and conference proceedings. He has successfully guided one Ph.D. scholar and has been guiding several other scholars.